Ask The Legend of Zelda fans which is the darkest, strangest entry in the adventure series and the answer will invariably be Majora’s Mask. But Link’s first Game Boy adventure, released seven years earlier, deserves inclusion in the short list of most unusual and affecting Zelda titles. Spoiler warning: this article examines the endings of Link’s Awakening and Majora’s Mask. A two-and-a-half inch screen and a four-colour palette in shades of grey – it doesn’t sound like much, but Nintendo wrung the most out of the Game Boy and created an engrossing adventure in Link’s fourth outing, The Legend of Zelda: Link’s Awakening. Released in 1993, Link’s Awakening features an expansive game world crammed into a relatively tiny 4-megabit cartridge. Dungeons are the bread-and-butter of any Zelda game, and the eight dungeons featured here are among the best designed in the franchise. From the gentle introductory course of the Tail Cave, the game charts a gradual difficulty curve, ramping up the complexity. Eagle’s Tower, the penultimate dungeon, has the player collapse four supporting columns – a challenge that requires a solid reading of your in-game map. The final level, Turtle Rock, is a sprawling cavern of molten lava and tricky floor tile puzzles. I’ve completed this game more times than I can count and these final dungeons always remain a test. Even with the limitations of four-channel chip sound, the score is superb. The Legend of Zelda: Link’s Awakening is a pocket-sized epic – technically all but flawless. The wistful atmosphere sits heavily in this scene. As Link and Marin look out to sea, the village girl conveys a sense of melancholy and anxiety about the future of Koholint. 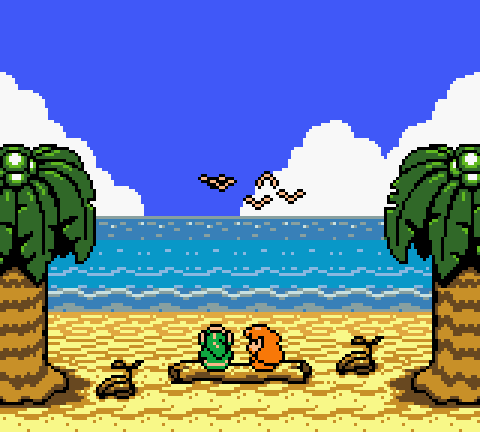 A reflective moment on the beach with Link and Marin in The Legend of Zelda: Link’s Awakening. Things fall apart – the truth of Koholint Island is revealed. The visit to the shrine is brief, but represents the Zelda series at its most immersive and intelligent – not only good design, but also good poetry. From this point, the tone becomes more oppressive. The revelation that Koholint Island is only a dream hits home. “If the Wind Fish wakes up, every-thing on this island will be gone forever! And I do mean… EVERYTHING!”: so the sixth Nightmare plays on this theme of looming destruction. As Link defeats each Nightmare in turn he obtains another Instrument of the Sirens to play the Song of Awakening: another layer of music is added, another layer of the illusion is stripped away. Like Majora’s Mask, Link’s Awakening’s supporting cast of eccentric but likeable characters is threatened by the end of the world – but only the player is aware that the island is a dream, and that Link’s friends will be destroyed with the awakening. When I dost awaken, Koholint will be gone… only the memory of this dream land will exist in the waking world… Someday, thou may recall this island… that memory must be the real dream world… Come, Link… let us awaken… together!! Of all the Zelda titles, Link’s Awakening is closest in spirit to Majora’s Mask – but the Game Boy adventure even pushes beyond that game’s grim tone of approaching doom. In Majora’s Mask, the apocalyptic, disturbing end sequence – witness a maniacally grinning moon obliterating a world of Link’s friends – can be averted as Link brings the “dawn of a new day”, saving the land of Termina, redeeming the villain, and healing himself. 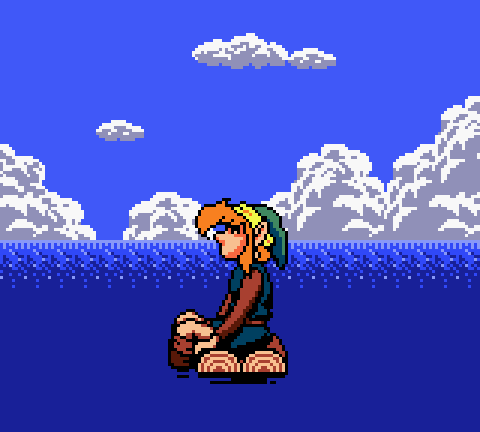 As at the beginning, Link is cast adrift on the ocean at game’s end – the same hero, but different. Link’s Awakening has no such happy ending. The final third is bleak: as a player you are complicit, aware that your actions will cause the ruin of the dream as well as the defeat of the nightmare. As the simple notes of the “Ballad of the Wind Fish” play out, the island and its inhabitants vanish forever. Link is stranded at sea again, alone, left only with the memory of Marin and her music as the Wind Fish soars overhead (only a secret ending of Marin flying away, achieved by completing the game without losing a life, allays this sad tone). What is a dream, and what is reality? 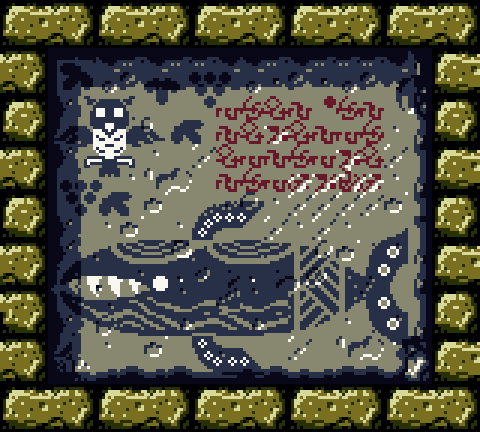 Link’s awakening, or the Wind Fish’s, or the player’s? Link’s Awakening is, in the end, just a video game, and Koholint Island is only a virtual world. But for the time spent in Koholint, meeting its inhabitants, exploring its beaches, forests, and mountains, this is the player’s reality every bit as much as it is Link’s, a reality that becomes a dream that endures as a memory. Sombre and tragic throughout, The Legend of Zelda: Link’s Awakening haunts the player after the dream is over. This retrospective is a revised version of an article I wrote for Nintendo games site www.N-Europe.com in 2006. Really nice perspective! Especially the final point about whose reality is valid. I love both these games, and I’ll never forget how sad I felt when I finished playing Link’s Awakening. I think it probably has a different meaning for whoever plays it. Maybe it’s about loss, maybe it’s about growing up, maybe it’s about life itself and how we face our own ‘nightmares’ to attain enlightenment. It’s brilliantly open ended. And I completely agree, the Ballad of the Wind Fish is a masterpiece! I bloody love this game. On the Game Boy, I remember stealing stuff from the shop and then that girl calls you “THIEF” for the rest of the game. Nintendo: teaching valuable lessons since always. I never tried to steal anything from a Hyrule shopkeeper after that! It is haunting. Well said. This is my favorite entry in the Zelda franchise. Maybe Breath of the Wild will dethrone it?